BEL ESPRIT (AUS) (Bay 1999-Stud 2003). 8 wins-5 at 2, BTC Doomben Ten Thousand S., Gr.1. Leading Aust. Sire of Winners 2012-13. Sire of 784 rnrs, 538 wnrs, 23 SW, inc. Black Caviar (VRC Patinack Classic, Gr.1), Bel Sprinter, Bel Mer, Afleet Esprit, Se Sauver, Gabbidon, Vivacious Spirit, Sweet Sherry, Keen Array, Iconic, Angels Beach, City of Song, Honey Flower, Loveyamadly, Audacious Spirit, Oregon Spirit, Strike the Tiger, Peach Tree, etc. Spurcific (f. by Flying Spur). 3 wins at 1000m, 1200m, A$297,805, VRC Brian Beattie H., MRC Rokk Ebony Cup, Betfair H., 2d VRC AR Creswick S., L, Voodoo P., MRC PFD Food Services H., Programmed Property Services H., Polar Air H., 3d MRC Tobruk 2YO H., Event Landscaping Solutions H., ALH Group P., MVRC City Jeep I Brought a Jeep H., 4th VRC Gucci Red Roses S., L, SAJC Dequetteville S., L.
Rock Right On (f. by Rock of Gibraltar). Winner at 1000m in Aust. Sakib (c. by Redoute's Choice). Winner at 1100m in Aust. Bred for Success (f. by Success Express). Winner at 900m in Aust. Lucky Ball (g. by Holy Roman Emperor). Placed in 2015-16, 2d HKJC Russell H.
That's History (g. by Canny Lad). Placed in Aust. FORGET (Exceed and Excel). 9 wins-1 at 2-to 1500m, A$402,825, to 2015-16, Newcastle JC Cameron H., Gr.3, ATC Tab.com.au H., Cellarbrations H., Pro-Ride H., Hungry Jacks H., Mostyn Copper Group H., 2d ATC Phillip Hughes Tribute H., NSW Tatt's RC TAB Supports Jockey Trust H., 3d VRC Henry Bucks Best Dressed S., L, MVRC Sportingbet H., ATC Vale Ian Anderson H., Wallabies Cup. Memorial (Street Cry). 2 wins at 2, A$337,250, ATC Cellarbrations Alexandria 2YO P., Blackwoods AAP Industries 2YO P., 2d ATC Silver Shadow S., Gr.2, Lonhro P., L.
Tantat Secret (Secret Savings). 12 wins-3 at 2-from 1100m to 1600m, A$416,590, VRC Hilton Nicholas 2YO H., MRC Gippsland Sprint Final H., MVRC Metropolitan Hotel 2YO P.H., Echuca Cup, 2d VRC True Version H., MRC Nicopolis H., MVRC Budget Rent a Car H., MRC Burrabil H., St Jude H., 3d MRC Vain S., L, MVRC Kenworth Austalian Made World's Best H., El Segundo H., Get Wines Direct H.
Daily Draw. Winner at 2, STC MTA Apprenticeships Plus 2YO H., 3d STC Canterbury Park Events Centre 2YO H.
Perfect Crime - Best Glory (Mac.) (Marauding). 2 wins at 2, A$688,440, M$94,800, AJC William Inglis Heroic 2YO Championship, Argos 2YO H., 2d AJC Up and Coming S., Gr.2, STC Heritage S., L, 3d AJC Sunnyside 2YO H., 4th STC Pago Pago S., Gr.2, VRC Debonair S., Gr.3, MRC Zeditave S., L.
Flaming Roberto. 5 wins from 1200m to 2050m, A$92,185, MVRC NZ Racing Conference Trophy H., VATC OBGFC My Little Angel H., 2d MVRC Energizer H., 3d Warrnambool Cup. Producer. Passenger. 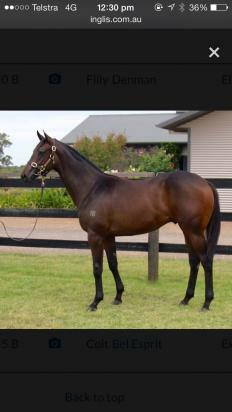 Winner at 1200m, STC Stickarama H. Sire. Perfect Draw (Whiskey Road). 4 wins. See above. Lancet (Encosta de Lago). 6 wins-1 at 2-to 1400m, A$216,039, Warrnambool RC Wangoom H., MRC Euclase H., QTC Look Aloft 2YO H., 3d VRC Springtime S., L.